Our Job Satisfaction Exceeds The Market, Thanks To Good Pay & Great In-office Support From Dispatch, Payroll & Our Owners! Now Hiring In The Salem, NH Area! 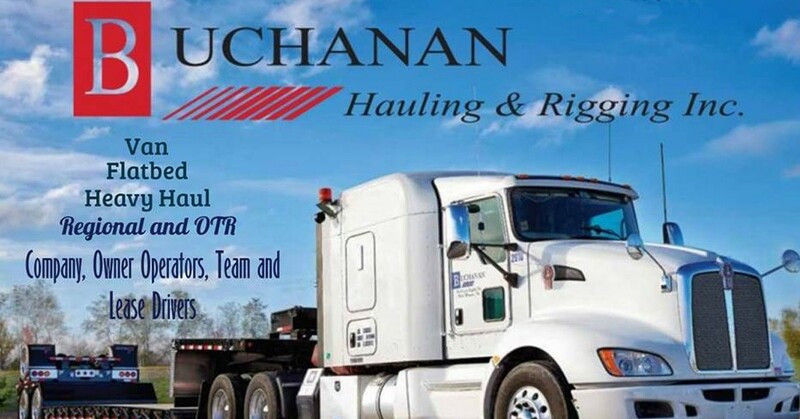 Whatever type of route you want to drive, there's a role for you at Buchanan. You might enjoy weekends at home, or you might seek adventure traveling to Mexico and Canada. We can offer it all, with all kinds of vans and trailers. Our job satisfaction exceeds the market, thanks to good pay and great in-office support from dispatch, payroll and our owners, Geary and Becky Buchanan. 26% to 30% of the Gross Line Haul, depending on experience and your safety score. Additional 1% with valid passport, tanker, TWIC & HazMat. 100% of billed tarp charges. After 3 months, you will receive a 1% pay increase (Maximum 30%). After 1 year, you will receive a 1% pay increase (Maximum 30%). $800 Guaranteed Gross Pay the first 8 weeks starting the week after orientation. Base Pay – 46 to 52 cpm depending on experience and your safety score. (All Practical Miles Loaded or not). Additional 1 cpm with valid passport, tanker, TWIC & HazMat. After 6 months, you will receive a .005 cpm pay increase (Maximum 52 cpm). After 1 year, you will receive a .005 cpm pay increase (Maximum 52 cpm). Payroll is directly deposited into your bank account weekly. We use TripPack and Transflo for Bills of Lading. We use QualComm/Rand McNally in all trucks/Most trucks have APU's. Comdata Fuel Cards/$100 cash advance per week. We use I-Pass for tolls. Health plans to choose from, for you and your family. (Starts on the 1st of the month following 60 days from start date). 401K matching up to 2% (Starts on the 1st of the month following 60 days from start date). Company cellular phone program available. Home weekends, depending on your location. Per Diem Plan available, at your discretion. Guaranteed pay starts the week following orientation. To be eligible, drivers must be available 5.5 days per week and not turn down assigned loads. *Additional requirements for qualifications may be imposed. No determination can be made on your eligibility until your qualification paperwork is received and reviewed by a Buchanan representative in Fort Wayne, IN.